SCUBA stands for Self-Contained Underwater Breathing Apparatus. First developed by Emile Gagnan and Jacques-Yves Cousteau before WWII, the Aqualung was the prototype unit of the compressed air tanks now used underwater. 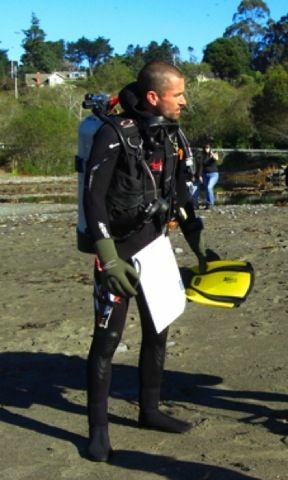 Modern equipment includes compressed air tank(s), regulator, and a Buoyancy Compensation Device (a vest that can be inflated and deflated by the swimmer). This system allows people to enjoy the benefits of staying below the surface for as long as an hour.